Biophysicist Prof. Timo Betz is delighted at the international research funding. Special award for Prof. Tim Betz from the Institute of Cell Biology at the University of Münster: the biophysicist has received the prestigious “Program Grant” research funding award from the international "Human Frontier Science Program" (HFSP). This programme – the only one of its kind worldwide – provides funding for first-rate researchers who work together on innovative research questions across the borders of both countries and disciplines. The selection process is rigorous, and Timo Betz is a member of one of only 30 teams of researchers who were able to win through against more than 1,000 applications. Together with cell biologists Penney Gilbert from the University of Toronto in Canada and Xavier Darzacq from the University of Berkeley in California in the USA, he receives funding amounting to around one million euros for three years. Physicist Timo Betz specializes in research topics in the field of cell biology. 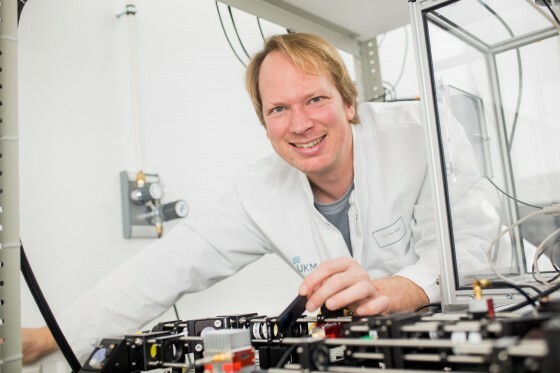 At the Cells-in-Motion Cluster of Excellence at Münster, he is researching into the mechanical properties of cells in order to understand how they travel around the body. In their award-winning project, he and his colleagues want to undertake research into how muscle stem cells wake up out of a deep sleep to regenerate muscle fibres. In doing so, they are pursuing a new theory that mechanical forces stretch the cells and thus “wake them up”. These mechanical forces therefore have a decisive influence on muscle regeneration. The HFSP is a programme which provides funding for international collaboration in the life sciences and is financed by 14 countries from around the world, as well as by the European Union. Part of the research funding is reserved for junior researchers. This search implements Google™ CSE. It uses files from a Google™ LLC webserver. Therefor some data will be transmitted to Google™ LLC.